Robert Green: Spring into Standards, Part 4: Sell, Train, Audit and Enforce to Make Standards Work! 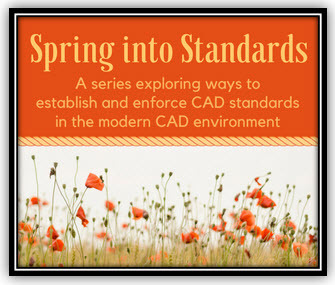 Spring into Standards, Part 4: Sell, Train, Audit and Enforce to Make Standards Work! This article is part 4 of a continued discussion on how the CAD environment has changed, making CAD Standards a much more complex, and perplexing challenge than in the past. It's time to rebuild your standards to reflect this new reality. "In this final installment of Spring into Standards, we'll focus on what comes after the initial rollout: standards maintenance. Much like any other change in a work environment, I find that making standards a permanent part of the culture requires a continual effort on the CAD Manager's part."